It is believed that the word land, landscipe or landscaef entered the English language some time after the 5th century. These terms referred to a system of human-made spaces in the land – spaces such as fields with boundaries, though not necessarily defined by fences or walls. It also referred to a natural unit, a region or tract of land such as a river valley or range of hills as occupied by a tribe, or later, ruled by a feudal lord. But when writing about environmental history, the term “landscape” is often used interchangeably with the term “environment” (also an ambiguous term) less in a static sense, and more in a sense that recognises the ongoing interplay between humans, environment, and other factors, such as climate. Personally, I don’t think there is a problem here. Words do evolve and take on new meanings as they are adopted by different fields, groups of people and cultures. Indeed, the incipient forms of environmentalism in many countries (including New Zealand) began with “scenery preservation” – the preservation of something “static”, associated with a state of pre-human influence (and generally appreciated for its scenic value). However, now environmentalism tends to involve a more sophisticated understanding of the environment – one that takes into account human and other influences, and seeks to preserve functioning ecosystems, rather than “states” in a static sense. 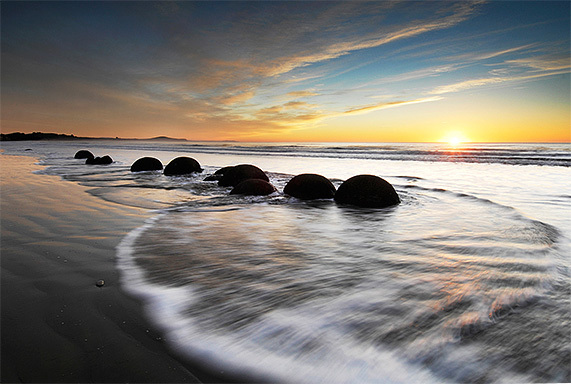 Photo: An iconic landscape: Moeraki boulders, Otago Coast. From the Sisson photography website.